The TCM Classic Film Festival doesn't officially start until Thursday but there was already plenty of interesting things happening on Wednesday. 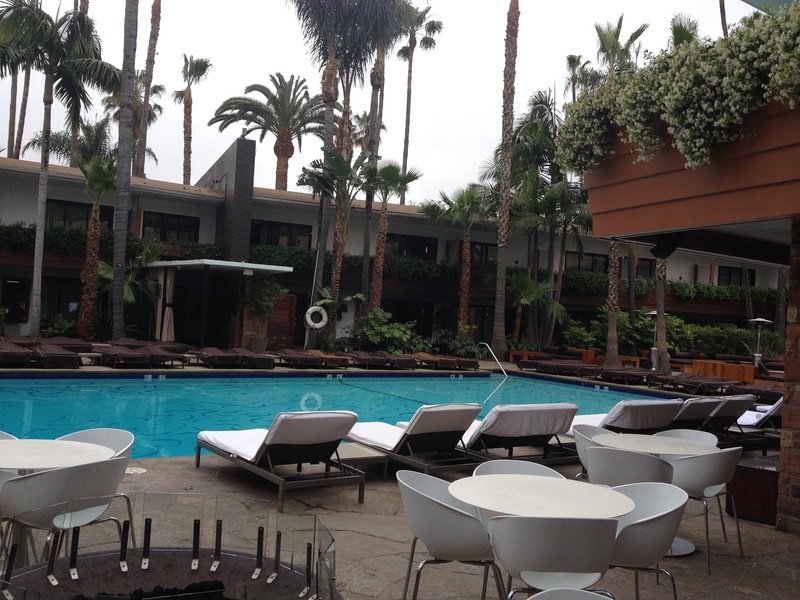 My day started with getting to meet several bloggers at the Club TCM lounge at the Roosevelt Hotel. It was great to meet Laura of Laura's Miscellaneous Musings, Jill of Sittin' on a Backyard Fence, Aurora of Once Upon a Screen..., and several others. I got my Media Credentials and headed to a separate room for a Media Roundtable. I was expecting a roundtable but it ended up being more of a Press Conference. Robert Osborne, Ben Mankiewicz, Charles Tabesh and Genevieve McGillicuddy (paired) took to the platform and fielded questions from us. I didn't end up asking any questions myself but a lot of the questions I had in mind were asked by others. I plan to do a separate post with much more detail about the questions and answers. I thought the conference went really well. Ben Mankiewicz was charming, it was quite wonderful to see Robert Osborne and he had a lot of great insights to share and Charles Tabesh and Genevieve McGillicuddy did a great job fielding lots of interesting questions about the festival and TCM programming. One thing I took away from this is the realization that TCM is unlike any other channel on TV. It has a devoted following, one that TCM treasures and they feel like they have a responsibility to deliver their programming in the best way possible. This is where they are holding tomorrow's South Pacific (1958) screening with special guests Mitzi Gaynor and France Nuyen. 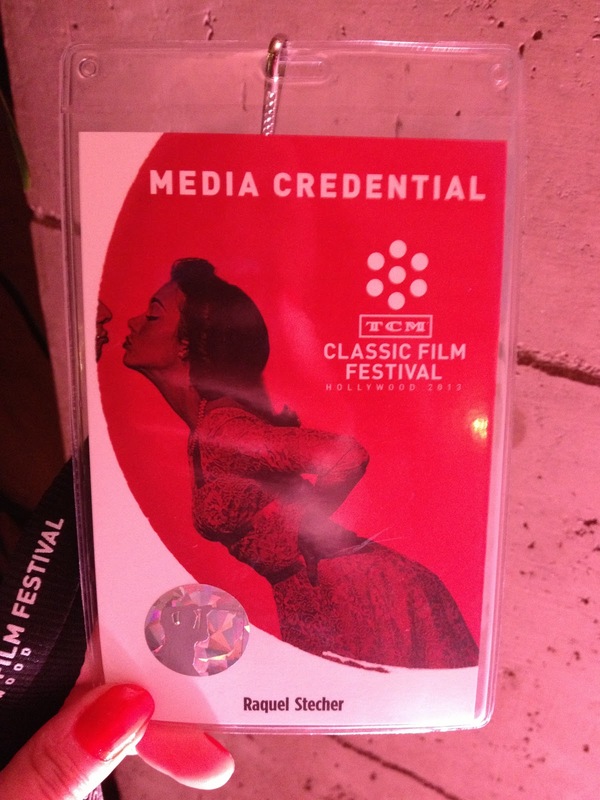 From noon until 3:30 pm, the Club TCM at the Roosevelt Hotel filmed a few interviews. If you watch TCM, you may see me in the background of interviews between Ben Mankiewicz and Theodore Bikel and Marvin Kaplan. 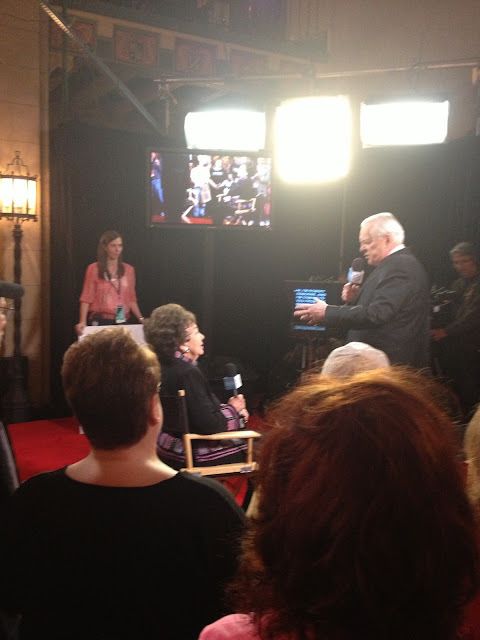 Jane Withers being interviewed by Robert Osborne. 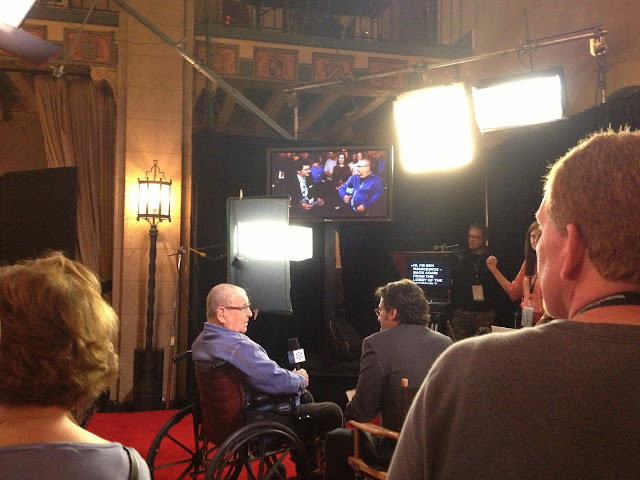 Marvin Kaplan being interviewed by Ben Mankiewicz. 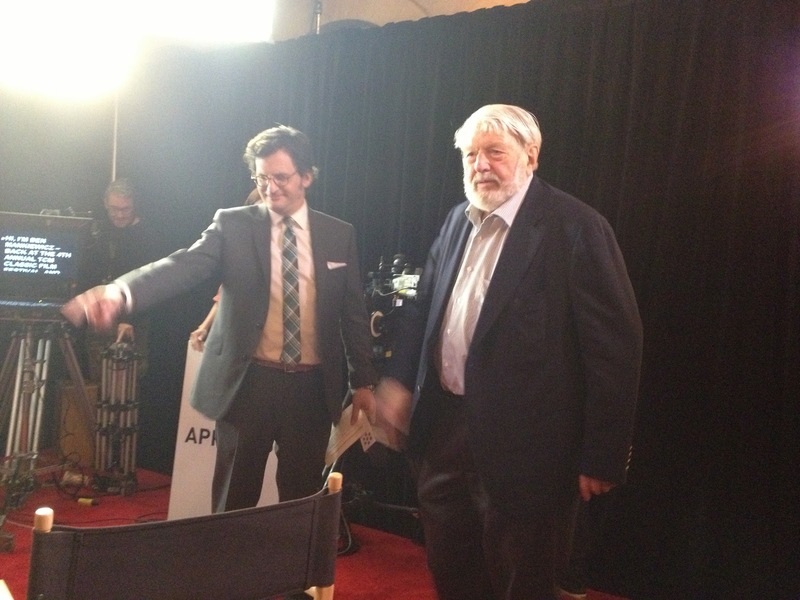 Ben Mankiewicz and Theodore Bikel! The TCM Boutique was open and they have lots of cool swag and other goodies for sale. 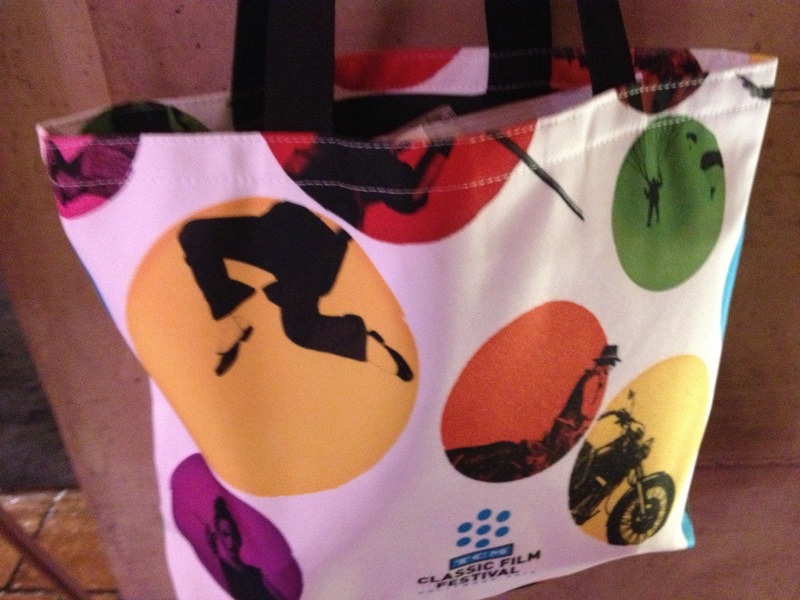 For now I think I'll stick TCM Classic Film Festival tote bag which is pretty awesome. Overall, a very good day! Today and tomorrow are really my only days to socialize and mill about. The following days will be very hectic for sure. Stay tuned for more details! You can always follow me on Twitter @QuelleLove for pictures and more details on the festival as they happen. Sounds like you're having a wonderful time already :) Can't wait to read more about it! I'm glad accompaning the tweets and informations you all give! By the way, didn' you take pictures with Aurora and Laura? I'd love to know how they look like! Welcome to Hollywood! Have fun and thanks for the pics! Very jealous, Raquelle! Great job on the report, and have a wonderful time!